While assaults like the Boston Marathon bombing and the attack on an anti-Islamic gathering in Garland, Texas, last month have been widely portrayed as acts of terrorism, critics say that assaults against African Americans and Muslim Americans are rarely called terrorism. The massacre of nine African Americans in Charleston has been classified as a possible hate crime, apparently carried out by a 21-year-old white man who once wore an apartheid badge and other symbols of white supremacy. But many civil-rights advocates are asking why the attack has not officially been called terrorism. Against the backdrop of rising worries about violent Muslim extremism in the United States, advocates see hypocrisy in the way the attack and the man arrested in the shooting have been described by law-enforcement officials and the news media. While assaults like the Boston Marathon bombing in 2013 and the attack on an anti-Islamic gathering in Garland, Texas, last month have been widely portrayed as acts of terrorism carried out by Islamic extremists, critics say that assaults against African Americans and Muslim Americans are rarely called terrorism. Moreover, they argue, assailants who are white are far less likely to be described by authorities as terrorists. “We have been conditioned to accept that if the violence is committed by a Muslim, then it is terrorism,” Nihad Awad, executive director of the Council on American-Islamic Relations, a civil-rights advocacy group in Washington, said Thursday in a telephone interview. “If the same violence is committed by a white supremacist or apartheid sympathizer and is not a Muslim, we start to look for excuses — he might be insane, maybe he was pushed too hard,” Awad said. Dean Obeidallah, a Muslim-American radio-show host and commentator, said it should be obvious that the Charleston killer was a terrorist. While Attorney General Loretta Lynch and South Carolina officials said the shooting late Wednesday was under investigation as a hate crime, much of the reaction on social media Thursday was caustic, with commentators saying they saw a double standard in such terminology. “A white-supremacist massacres 9 black people in Charleston. It is a hate crime it is terrorism, it is America 2015,” Remi Kanazi, a Palestinian-American activist and poet, said on Twitter. The definition of terrorism is a shifting and contentious subject, usually with political overtones. The antagonists in the Syrian war and the Israeli-Palestinian conflict, for example, routinely accuse each other of terrorism. Militant organizations such as al-Qaida and the Islamic State group, also known as ISIS, which consider themselves liberators, are officially regarded by the United Nations, among others, as terrorist groups. 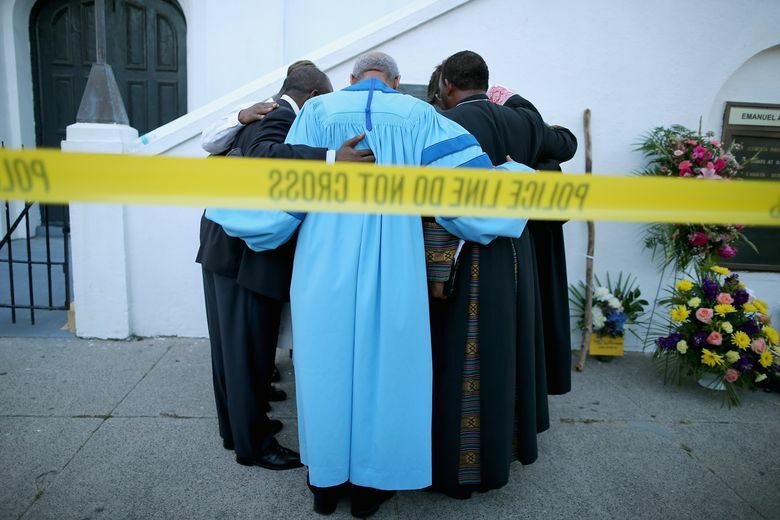 Civil-rights advocates said the Charleston attack not only fit the dictionary definition of terrorism but reflected a history of attempts by the Ku Klux Klan and other white-supremacist groups to terrorize African Americans. “The first anti-terrorism law in U.S. history was the Klan Control Act, so really, this has been the definition of terrorism,” William Jelani Cobb, a writer and director of the Africana Studies Institute at the University of Connecticut, said in a Twitter post. Abraham Foxman, national director of the Anti-Defamation League, a civil-rights group, said the Charleston massacre looked like terrorism to him. “While the terrorist label is often applied to attacks, plots and conspiracies carried out on behalf of designated terrorist organizations such as ISIS and al-Qaida, politically motivated violence is not the sole domain of supporters of designated terrorist groups,” Foxman said in a statement.